We are not currently accepting advertising offers for the site. We hope to reopen advertising applications for late 2016. Thanks for your patience! Currently, this website receives over 60,000+ visitors per month and close to 200,000 page views (or impressions) per month. We rank at the first page of Google for the phrase "baby sign language", as well as top search results ranking #1 at Google, Yahoo, and Bing for thousands of other baby signing related keyword terms. Who does this advertising opportunity belong to? Any individual teaching Baby Sign Language classes. Please note that if you have any additional (other than yourself) instructors in your program, these such organizations or businesses will advertise in the Category, below. 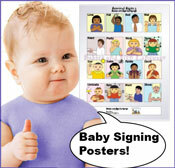 Your ad appears on the page corresponding to the state in which you teach Baby Signing Classes. Ad appears above the standard alphabetical listings with option of image, live* link to your site, Image Size up to 200x200Limit of 5 Sponsored Ads per page. If a page has a total of 5 Sponsored Ads, additional requests will be placed on a waiting list. To stop ad, simply go to Paypal and click their "Stop Subscription" button! Questions about these advertising opportunities above? Please click here and ask away! * Check or money order payment is accepted for the permanent sponsor ad only. Please click here to fill out form to send by check or money order. A receipt will be returned, should you add a SASE. Who does this opportunity belong to? C. Your own personal contact form - visitors may contact you from your page - on the spot! C. Your own personal contact form - visitors (with no tiring extra mouse clicks) may contact you directly from your page - on the spot! 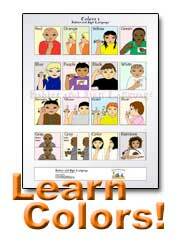 This is the most visible page of the entire Babies and Sign Language Website! Ad is placed 'above the fold', near the top of the baby sign language home page, where more than 200,000 pairs of excited eyes view every day! Most are moms / females. * Ads submitted are to be 25 words or less, including a link to your website - which counts as one word only. Please note that if your link is over 30 characters, a 'tiny url' may be used instead. Link viewable from all pages, via footer area of Babies and Sign Website - If a page has a total of 5 Site-wide Sponsor Ads, additional requests will be placed on a waiting list. *Your website link is rendered clickable, which will be shown via your URL in typical word font, blue in color, as well as with a blue (or purple) underline. Link is coded using rel=nofollow html. Please note - we do not sell links. If any one promises you a link to be posted on this site for payment, then they are trying to take your money. Please let us know if this happens to you so that we may report them to the appropriate authorities. Thank you!